There are a lot of advantages to choosing a counter top water ionizer over one of the under counter models – but then there are some good reasons why you wouldn’t want a counter top water ionizer too. We’ll take a look at the pros and cons of choosing a counter top water ionizer model over one of the under counter versions. 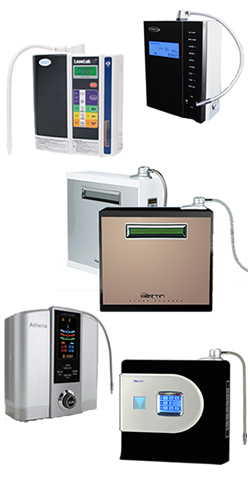 The biggest advantages of counter top water ionizers are the cost and the wide selection of different models available. A wide selection is a good thing given that this thing is going to be sitting on your counter and you’ll be looking at it every day. Counter top water ionizers come in a variety of shapes, sizes and colors. Some companies also offer different color options with the same model giving customers more choices when it comes to matching their water ionizer with their overall kitchen décor. Cost is another advantage counter top models have over under counter models. Under-counter models will cost at least $500 more than the counter top equivalent with some companies charging $1,000 or more for under-counter versions of their top counter top water ionizers. Depending on the size of your sink, countertop models can make it easier to fill containers with alkaline and acidic water simultaneously. You can fill a bowl or other container with alkaline water on your counter top using the top dispenser hose while filling a separate container with acidic water in the sink. This is particularly helpful when preparing produce which is washed with alkaline water then given an acidic rinse to maintain freshness and rinse away any remaining bacteria or other residue. Advanced control features are often easier to navigate with the full-size control panel on the front of the unit. When it’s time to change the filters or run a cleaning cartridge, having your water ionizer on the counter makes performing these routine maintenance operations easier and more convenient. The standard installation for counter top models – once you’ve identified all of the parts, laid them out and are ready to go – can be completed in as little as five minutes! Some counter top water ionizers allow you to plumb them directly to the cold water line below the sink – freeing your faucet but the unit still sits on the counter. This alternate installation method may add an extra 15 minutes to the installation time but is still fast and easy. Most obvious is that they sit right there on your counter. Although most will have a wall-mount option, the unit is still clearly visible. If you do choose the wall mount option you’ll still have hoses visible and taking the unit down to perform regular maintenance can be inconvenient. Having a water ionizer sitting on your counter can eat up valuable counter space. Some water ionizers have a slim design, others are more compact – which will leave you more usable counter space but overall, one of the biggest reasons people go with an under counter water ionizer is because they want to avoid having yet another appliance on their counter.Even when plumbed directly to the cold water line you’ll still have the acidic drain hose hanging into your sink. Convenient for moving around and filling multiple containers but for some it’s just unsightly. If you’re a minimalist, a counter top water ionizer may not work with your idea of esthetics. Although some counter top models are sleek and attractive with minimal control panels, some people may not want such an conspicuous appliance sitting right next to their sink.